Neil Gaiman (Sandman, Coraline, American Gods) brings shock rocker Alice Cooper’s concept album to life in a surreal sideshow of the soul! Join a young boy named Steven on a surreal journey of the soul, as an enigmatic and potentially dangerous Showman seduces him into joining his carnival. Celebrate the 20th Anniversary of this seminal Gaiman work, returned to print for the first time in over a decade. Fully remastered in color, this Deluxe Edition incorporates complete scripts to all three chapters, black-and-white thumbnail art of pre-colored pages, an original outline of the project by Neil Gaiman, and a collection of letters between shock rocker Alice Cooper and the author! 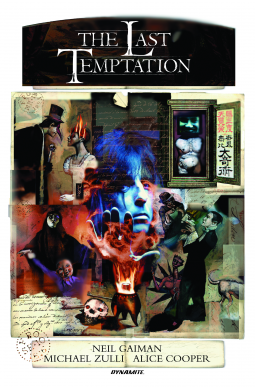 “I’m really happy that The Last Temptation is coming out for a new generation of readers, who have not seen Michael Zulli’s glorious drawings, or know of the Showman and his wicked ways,” says Neil Gaiman.